Description: By results of the analysis of singularities metrological of security of air engineering and arms the complex index of effectiveness of operation of a system metrological of security is offered. Khyzhniak, V.V. and Martsenkivskyi, V.T. 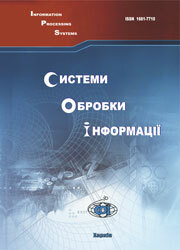 (2002), “Vyznachennia kompleksnoho pokaznyka efektyvnosti systemy metrolohichnoho zabezpechennia”, Information Processing Systems, Vol. 6(22), pp. 373-377.